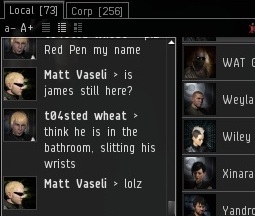 Last time, when the miners of Kino fell victim to a bizarre rumor that I had been banned from EVE, one disgruntled ice-slinger made a sly joke about how if I hadn't left the game, someone might have gotten upset enough about my bumping to murder me in real life. The good news is that I was never banned, so the issue of whether I might kill myself over it didn't need to be answered. This wasn't the first time the miners of Kino pondered the self-regicide of their Supreme Protector. A few days ago, when I indulged in a bit of AFK cloaking (a practice I often enjoy), some miners speculated about where I could have gone. 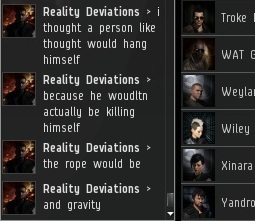 Perhaps the reason highsec miners are so fascinated by the idea of me killing myself is the old paradox: Can an Invincible Stabber be so invincible that it cannot be killed even by itself? Fortunately for all concerned, I returned from my spell of AFK cloaking with wrists fully intact and neck unbroken. For the curious, I'm of the opinion that even if I initiated the self-destruct sequence on my ship, it would not explode. I haven't ever felt the need to try. I know that there is much important work to be done. How can I depart from this world while there are still miners in desperate need of my guidance? Quite interesting that you're portraying us joking around about your inibility to do your self elected job as "tears". Be it because you're banned, or just being more of a loser than you claim us to be by sitting in a system "afk cloaking" you sir are the epitomy of troll, I salute you for that, but if you truely believe you are doing this as a righteous cause, you sir need to be in a straight jacket. Don't worry, I won't ask you to admit you're a troll, I'll just assume so because no one can be as much of a nutcase as you appear to be. When taken out of context like they are here, yes, yes they are. Is there anything wrong with that? Not at all. 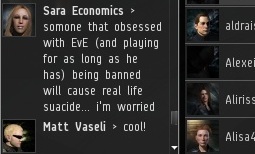 "Perhaps the reason highsec miners are so fascinated by the idea of me killing myself is the old paradox: Can an Invincible Stabber be so invincible that it cannot be killed even by itself?" Invincible as it may be, the Invincible Stabber is, alas, sadly not all-powerful, it cannot 'invincibilify' itself to destruction. On the other hand if the Stabber was all-powerful, which it may be it would be a paradox as it would have to be powerful enough to destroy itself whilst being invincible to the point of indestructibility. Therefore we must come to the (now) obvious conclusion that the Invincible stabber cannot be in-fact killed by anything, including itself. Impressive, perhaps persuasive reasoning. But another definition of "invincible" is "incapable of being defeated." One could interpret that to mean that an Invincible Stabber will always be victorious in whatever it intends to do. If so, does that mean an Invincible Stabber intending to destroy itself must be successful? I feel that assuming "incapable of being defeated" must result in victory is false as in that sense it only directs attention towards the defeat aspect rather than victory. Instead the Invincible Stabber would reside in a never ending battle against itself should it ever intend to destroy itself.